Do you love a great makeover? We do too! Recently, H2o Salon had the privilege of participating in Eufora's 2018 Makeover Madness. We joined with salons around the country in transforming our models' hair and makeup to create some fantastic looks we love. Would you like to see? 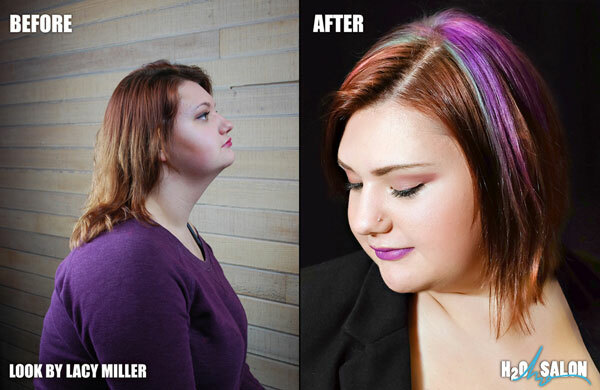 Check out the makeovers below! Who says makeovers can't turn out both professional and fun? Edith's can! When working with model Tina Stewart, Edith chose a gorgeous A-line bob cut to flatter Tina's lovely face. Edith interspersed Tina's locks with thin slices of vibrant color, using a combination of Citrus Orange, Purple Iris, and Sunflower Yellow from Eufora's Artisan color line. For shampoo and conditioner, Edith chose the Eufora Frizz Control shampoo and conditioner, and then followed those with Eufora Sculpture and Eufora Illuminate. After blow-drying, Edith added the Curl'n Defining Solution by Eufora and then Tame by Eufora as well to finish off this great makeover. Runway ready! 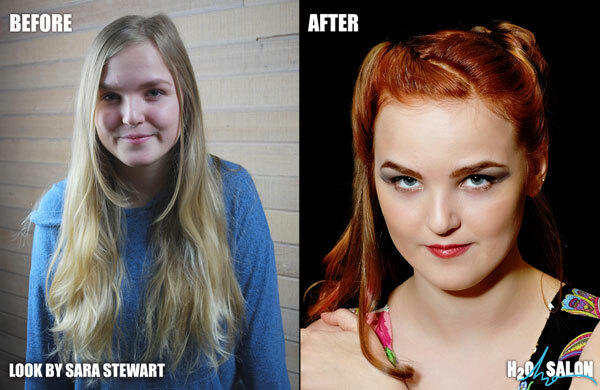 That's what we have to say about Maggie's beautiful makeover with Kathy Bock. When working with Kathy, Maggie chose the stunning shades of Fuchsia Berry blended with Lime Blossom and Aloe Green from the Eufora Artisan line to create this vibrant shade for Kathy's curls. For shampoo, Maggie used the Eufora Beautifying Elixir Bodifying shampoo, and then followed that with the great styling products of Eufora Sculpture, Illuminate, Smooth'n Straightening Balm, Pure Polish, Boost, Retain, and Elevate to craft every curl. Beautiful! Breathtaking curls, color, and makeup complete the makeover that stylist Sara Stewart designed for model Clare Herrick. 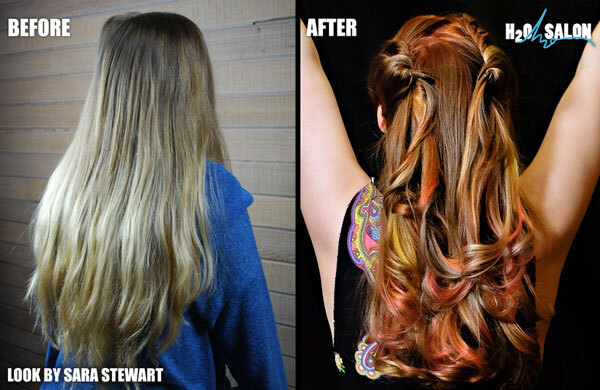 With strands of Eufora Artisan Sunflower Yellow, Citrus Orange, Red Rose, and EuforaColor 8.11 interwoven throughout the waves of Clare's hair, Sara crafted a multilayered waterfall of color, and then finished up her work with a skillful application of Glo Makeup. We think the woodlands are missing a beautiful faerie, don't you? 'Fiery and feisty' could describe the look that stylist Amy Graef created for lovely model Sierra Dupliessis. 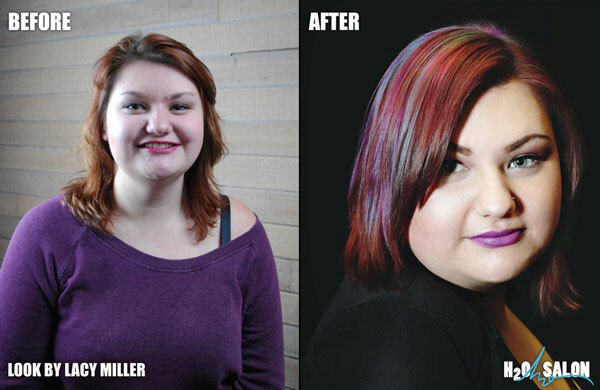 To achieve this fantastic color, Amy used Eufora Artisan shades of Citrus Orange, Sunflower Yellow, and Fuchsia Berry. She washed Sierra's locks with Eufora Beautifying Elixirs Bodifying Shampoo, and then set Sierra's hair with Eufora ElixirOne, Eufora Sculpture, and Eufora Behave before blow drying. After that, she protected Sierra's locks from heat styling—and helped them hold their curl—with the use of Eufora Retain. She finished the look with Eufora Elevate and Eufora Illuminate for body and shine. We think Sierra looks ready for some fun in the bright summer sun, don't you? Vibrant. Stunning. Professional-yet-fun. So many words could describe the exquisite look that stylist Lacy Miller crafted for model Jace Stone. Using a fabulous color melt technique to create an organic blend of hues, Lacy combined shades of Eufora Artisan Purple Iris, Teal Waters, and Pink Peony, along with EuforaColor 6.6. To finish off this beautiful design, Lacy used Eufora Sculpture, Eufora Illuminate, Eufora PieceWorks, and Eufora Elevate. Gorgeous! Want your own makeover? Interested in any of the products you've read about here? Come see us for a complimentary consultation. We'd love to help you craft your own new, just-for-you look. Call us at 217-337-1480 or book an appointment online today! Newer PostFree Services on First Friday! Older PostH2o Salon Welcomes Author Gina Johnson!